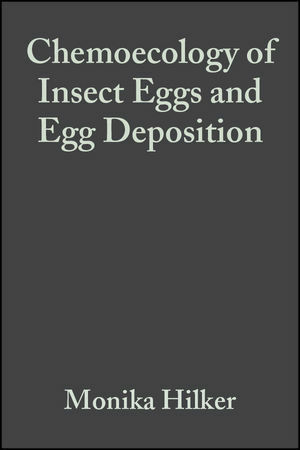 This is the first book focusing on the chemoecology of insect eggs and egg deposition. It covers a wide range of different issues including herbivorous and carnivorous insects, social insects and those of medical and veterinary importance. The knowledge compiled in this book may promote future studies on evolutionary aspects on insect reproductive behaviour as well as on controlling insect pests by targeting the egg stage. Monika Hilker is a biologist and a professor at the Freie Universität Berlin. She leads the Applied Zoology/Animal Ecology working group at the Freie Universität, studying the chemical and molecular ecology of plant-insect interactions. Torsten Meiners is the author of Chemoecology of Insect Eggs and Egg Deposition, published by Wiley. Chemoecology of Insect Eggs and Egg Deposition: An Introduction (Monika Hilker and Torsten Meiners). Novel Morphological and Physiological Aspects of Insect Eggs (Ioannis P. Trougakos and Lukas H. Margaritis). Insect Accessory Reproductive Glands: Key Players in Production and Protection of Eggs (Cedric Gillott). Chemical Protection of Insect Eggs (Murray S. Blum and Monika Hilker). Paternal Investment in Egg Defence (Thomas Eisner, Carmen Rossini, Andres Gonzalez, Vikram K. Iyengar, Melody V. S. Siegler and Scott R. Smedley). Brood Protection in Social Insects (Manfred Ayasse and Robert J. Paxton). The Role of Microorganisms for Eggs and Progeny (Rupert L. L. Kellner). Plant Chemical Cues Important for Egg Deposition by Herbivorous Insec6ts (Erich Stadler). The Plant’s Response towards Egg Deposition (Monika Hilker, Odette Rohfritsch and Torsten Meiners). Oviposition Pheromones in Herbivorous and Carnivorous Insects (Peter Anderson). Chemoecology of Oviposition in Insects of Medical and Veterinary Importance (Philip J. McCall). Chemoecology of Parasitoid and Predator Oviposition Behaviour (Johannes L. M. Steidle and Joop J. A. van Loon). Evolutionary Ecology of Oviposition Marking Pheromones (Thomad S. Hoffmeister and Bernard D. Roitberg. Evolutionary Ecology of Oviposition Strategies (Niklas Janz).